Technology and with it Social Media is changing the events industry from the inside out. In one way or another, current industry trends are linked to tech developments ranging from experiential meeting planning to ROI measurement. As an integral part of modern technology, social media are not only gaining broader acceptance among attendees at live events and other professional meetups but are also gradually adapting their nature to the changing environment that characterises the digital era. Today we take a look at the three main ways in which social media are becoming more event-centric and bringing like-minded professionals together into meaningful experiences, both face to face and online. Personalisation is one of the defining trends of the 21st century. When it comes to meeting planning, social channels can help rise to the challenge of personalising the experience for hundreds or even thousands of attendees. Social networks give access to a wealth of data, which make it easier than ever to fine-tune every aspect of conferences and other events and to deliver exactly what the audience wants. Organisers can use these platforms to gather data directly from attendees via surveys and other direct feedback methods, and the results can be used to give a personal touch to crucial aspects of the meeting, like the registration process, seating arrangements, agenda selection, etc. Instagram or Twitter hashtags are one of the most useful tools in this respect. Don’t limit the use of hashtags to the name of the event: to increase the personalisation levels of each meet up, you can create hashtags for “micro-moments” at the event and use them to draw the audience in (e.g. ask a keynote speaker, share the highlight of the morning session, etc.). Lastly, personalisation is the key to a successful brand marketing strategy. If we view meetings as brands in themselves, we can easily create an identity for them using visual tools like Pinterest, which help define the meeting’s style and create a personal connection with attendees who identify with it. Immersive experiences are naturally robust and engaging. Organisers can turn meetings into immersive experiences using favourite social channel features, like real-time streaming or curated user-generated content with a high visual appeal. Live videos in the form of stories are one of the key social media trends due to their ability to capture attention and keep viewers engaged. You can put the power of storytelling right into the audience’s hands by encouraging them to publish Instagram or Snapchat stories, or make the meeting more immersive by building a sense of community around it with platforms like Facebook and LinkedIn, which rank high for their community building potential. Real-time interaction is an integral part of the nature of every social network, and recently we’ve seen how this aspect is being brought into meeting planning. For example, Periscope lets attendees broadcast their meeting experience. Periscope live streams can be hashtagged and once published. They are live for at least 24 hours, so they can help extend the meeting’s momentum beyond its end date and be used for future event promotion purposes. Similarly, over the past couple of years, LinkedIn has been offering the option to take part in invitation-only online events, mainly built around video interviews with recognised influencers in different industries, Q&A style. This tool could be used to connect the audience with keynote speakers before, during, or after a meeting. 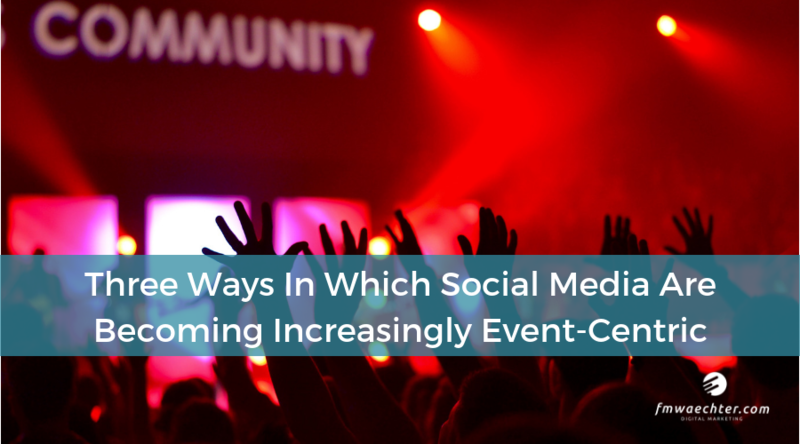 All social media channels are diversifying their offerings with a focus on making events more participative, interactive, and genuinely engaging, and that’s undoubtedly a sign of where things are headed in the event marketing industry as a whole. Before you start planning your next meeting, why not speak to a digital strategist about how to make social platforms work for you?